Ethereum (ETH-USD) shed more weight in this week’s trading, on the back of reduced demand (lesser number of ICOs) and also from potential ICO cashout effects. Many investors who earned bonuses from ICOs launched in 2017 and early 2018 are still selling off their excess holdings for ETH, and then converting ETH to liquid cash. So what does the next week of trading hold for ETH? The US Securities and Exchange Commission rejected 9 ETF applications, citing lack of sufficient protection for investors in the structure of the Bitcoin ETFs. Though it was disappointing for the crypto markets, it only had a minor dampening effect on prices as this decision had already been priced in. The opening is still there for an Ethereum ETF; which Vitalik Buterin (Ethereum founder) has endorsed, though with hesitancy about its importance. 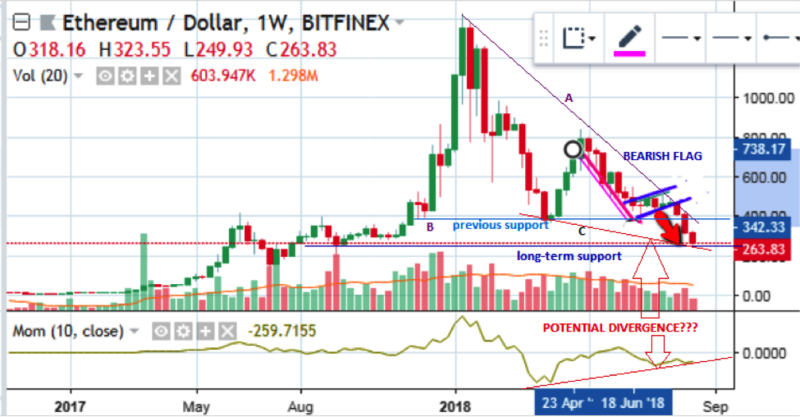 The technical analysis for ETH/USD starts with the weekly chart. This chart indicates a number of important points. 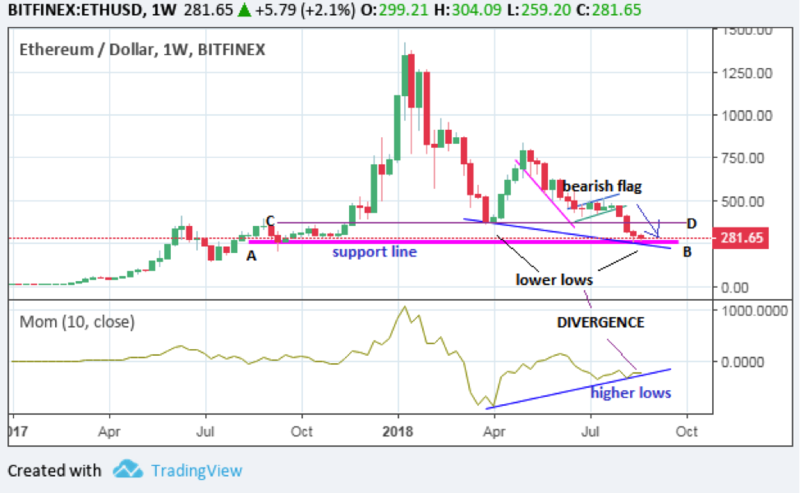 a) Price formed a bearish flag over the course of three months; from April to July 2018. This bearish flag resolved in August to produce the bearish movement that has stalled at the support line A-B. b) There is a line C-D which served as support until it was broken by the downtrending breakout from the bearish flag. c) The momentum indicator has formed higher lows while price is forming lower lows. This is a divergence situation. d) The current candle closes at midnight UTC+1. The relationship of the closing price to the support line is of paramount importance and will dictate the price direction for the last week of August and beyond. e) The support line is at $281.65. The next support below this is at $140.22, while the closest resistance above is at the previous support that was broken last week, at $369.71. There are two possible scenarios as to how this setup will eventually play out. Putting all these points together, price is expected to bounce off the present support level, in an attempt to correct the divergence. This view is supported by the presence of two pinbars at the support level. Also notice in the previous weekly chart shown above, the presence of an evolving falling wedge, with borders marked by the descending trendline A and the falling trendline C. This also adds credence to the scenario where we may see bullish reversal going forward. The second scenario would be for price to breakout below the current support area. For this to happen, we need to see the weekly candle close below this support. However, there is nothing yet on the chart to support this view. This is unlike the previous scenario where we see at least three technical reasons to support a bullish recovery. So what would be the outlook for the ETH/USD pair moving forward? The overall market sentiment for the cryptocurrency market in the long term is still bearish. However, the chances of a bullish retracement occurring are quite high. Therefore, we are likely to see price recovery in ETH/USD if, by the end of the week, a downside break of the support has not occurred. However, this is going to be just a bullish recovery. For us to see a bullish reversal, some positive news has to hit the markets to spur buying sentiment. Buyers and sellers of ETH/USD can participate in this market. For buyers, they may want to trade the brief bullish rally. However, this rally will probably stall at the previous support-turned-resistance, located at the $369.71 mark. Buyers would also need to look at the Fibonacci retracement levels or the Fibonacci fan lines to see possible areas where such a rally would end. Sellers looking to sell on the rally may decide to do so if the resistance line holds firm. The picture will become clearer in the weeks to come. This piece is for educational purposes only and should not be construed as a recommendation to buy or sell ETH at any price. The cryptocurrency markets are very volatile and require that the user is well-funded and has a good amount of trading experience. Disclosure: I am/we are long ETH-USD. Business relationship disclosure: This article was written in partnership with an analyst. Next articleIs Amazon Getting Serious About Blockchain?